By the Yard, sew on VELCRO® tape. Crafters, designers and anyone else who sews knows that VELCRO® Brand Sew on Tape can be a lifesaver. 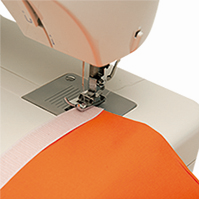 Whether you’re creating doll clothes that need to be fastened or fashioning a weatherproof sleeping bag that needs heavy-duty protection on its openings, you’ll find what you’re looking for in our extensive collection of sew-on VELCRO® Hook & Loop. Multiple-yard orders will be combined into rolls.